I thought I'd make a topic about it, as I truly believe it is worth it. The more time you spend in a positive vibration (such as feeling happy or joyful) the more the cosmos will work toward giving you more of that, such as things or events in your life that make you happier. However: If you instead focus mostly on what you don't want instead of what you do want, you'll get more of what you don't want and life will seem miserble. I know this because I've experienced it first hand. I've seen so many examples in my own life and in others around me. It's all in the mindset, it really is. People often call things "Coincidences" when they don't understand why something has happened when in fact there is some deeper logic, or force, if you will. It is the Law of Attraction, like attracts like. Positive vibrations (happiness, joy, excitement etc) attract more of the same and will make you feel even better. Negative vibrations (guilt, sadness, sorrow etc) attract more of the same and will make you feel even worse. Focus one's thought upon the thing desired with great feeling such as enthusiasm or gratitude. Feel and behave as if the object of one's desire is already acquired. Thinking of what one does not have, they say, manifests itself in not having, while if one abides by these principles, and avoids "negative" thoughts, the Universe will manifest a person's desires." The awareness of the Law of Attraction is truly life altering, whether you're aware of it or not, it is always in effect. If you think you "Can't Have" something you want, you're absolutely right. If you absolutely believe you *Already* have it, you will receive. I highly recommend you watch the DVD's mentioned here (Secret, What The Bleep - Down the Rabbit Hole) and read the books (The Amazing Power of Deliberate Intent, and any others you can find on the subject) and just be open to what they have to say. Try finding them at your local library or bookstore, Amazon works great too. As some might point out: "If there really is a Law of Attraction, why is there so much poverty, illness and death?" Because peole focus on scarcity and not on abundance. They focus on these negative things, and put all their energy into them, which only creates more of it. That is my opinion, anyway. You have been armed with knowledge, use it well. Please feel free to discuss the topic, it will be interesting to watch. This is the silliest nonsense I've ever heard. These mysterious "vibrations" you speak of have never been demonstrated scientifically and are untestable. Just because you think something isn't a coincidence doesn't mean it isn't. If you can provide empirical data proving that these things aren't coincidences I would be glad to see it. Until then, they are just that: coincidence. The world could use less of this mumbo-jumbo and more critical thinking. "Physicist Ali Alousi, criticized ""the law of attraction"" unmeasurable (and therefore unscientific) as well as questioning the likelihood that thoughts can affect anything outside the head". In my opinion, the only truth in this text Chester, is that Positive spreads Positive and Negative spreads Negative. This has never been scientifically supported. Keep an open mind though. Have a look at what little we know about the universe and it`s complexity. Most scientists today believe that mass is limited and space is infinite. Can there really be an infinite of nothing? If you acknownledge that the universe exists, then you also acknownledge that nothing is impossible. Yes, the universe is really this insane. I have always been a big believer of human "present ignorance". We create our limits today only to break them in a certain amount of time. 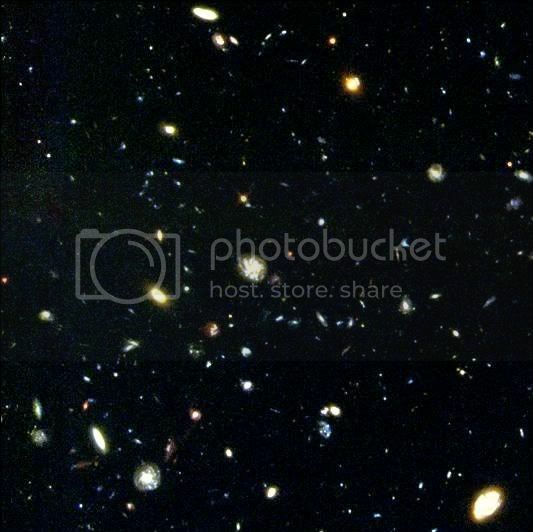 This pic is called the "Hubble Ultra Deep Field", and shows a picture from the furthest distance into space mankind has ever seen. The galaxies shown here are almost as old as the big bang. Who would have thought we could see 78 billion lightyears into space 50 years ago? Well, I thought I'd share this, as I feel it has alot of significance. If you don't, no problem. The only significance that this has is that it shows the utter lack of rational thought in the world. People who think positively may be more proactive in making good things happen in their own lives even if they don't actively mean to do so. Perhaps they interpret consequences of certain actions as more positive or put more of a positive spin on them than someone would who is more pessimistic. The idea that these things happen to people because they think happy thoughts and, as a result, these ridiculous and non-existent "vibrations" make wonderful things happen to them is utterly ridiculous. Why shouldn't we want to prove them scienfically and know a little bit more about the world in which we live? When did wanting to know the truth through scientific inquiry become a bad thing? Chester made an extraordinary claim that requires equally extraordinary evidence. If he can't provide that evidence then why should I believe it? Like I said before, just because you want something to be true because it makes you feel good doesn't make it true. That's why we test things, to see whether or not we can take them seriously. What virtue is there in believing something simply because someone once told you to do so without any explanation why? Ehco, you have a very good point. The thing is, the principles of the Law of Attraction don't fit into normal scientific models or methods, it's that simple. With our "Traditional" science it doesn't make much sense and yet this theory is built deep into quantum physics. We do not understand much of the universe still and yet this new way of thinking could open doors and new possibilities. Look at it this way. Hundreds of years ago people thought the earth was the center of the universe, if it had not been for Galileo Galilei we would have figured it out slower (someone else would have to figure it out instead) perhaps alot slower. People persecuted him until he was placed under house arrest and forced him to admit that he was wrong. See the stir new ideas or concepts can create? All that is required is a little open mindness. You use the heliocentric vs. geocentric model as a way to prove that your Theory of Attraction is correct by claiming that, at one point, nobody believed Galileo or Copernicus either. The difference between this and the Theory of Attraction is there really is evidence to support a heliocentric solar system and it can be measured directly. It doesn't transcend scientific scrutiny. You say that this Theory of Attraction somehow transcends science and cannot be tested or proven. To me, that seems like a cop-out. You have basically said "I believe it because I just do," instead of "I believe it because of this evidence." Anything that has a direct influence on our lives (as you claim this to have) can be measured and can be tested using regular scientific methods. You also seem to like to throw out the words "Quantum Theory" a lot without knowing what it is. Most quantum physicists have just scratched the surface of this theory and don't even fully understand what it is, let alone you and I. The old adage is, "If you think you understand Quantum Mechanics, you don't understand it." If you don't have any proof of this theory being true because it is impossible to prove it, why on earth would your believe it? Most people tend to mistake my criticism as close-mindedness which couldn't be further from the truth. All I am saying is that there isn't enough proof (or any for that matter) to conclude that this is a legitimate way of understanding the universe. If you can provide it I am on board with this theory all the way. That's how science works. You can't just decree that something is true and then proceed to say that it is impossible to prove it. That is certainly NOT how science works. Chester, is there any special reason why you think this might be true? As it is fun to read about stuff like this, you might as well believe in something like our galaxy being a marble (ref. Men in Black), as there is no proof to this theory. Imagine if i suddenly started to state that Mankind and everything we do is controlled by aliens in a spaceship hiding behind Jupiter. And continue imagining that i managed to gather a couple of thousand supporters, then perhaps even more people would start questioning this as something that just might be true. While all the Scientists at CERN and NASA are laughing at me, the everyday guy think that I might be correct. Another thing that also always has annoyed me or rather intrigued me about the human species, is that we always tend so seek towards what is "magical" so to speak, or out of the ordinary. We start thinking: "What if?". What if this is true? Whilst there is no mathematical proof. This is also why Conspiracy theories always gets such huge attendance, everytime a theory is released. I see there are many opinions, which is good. We all have our opinions and that is fine. Yes, it is true that what Galileo Galilei proved about the sun and earth was based on science, but that was not my point. The point is that new or strange concepts (such as the concept of the Law of Attraction) can create revolt, the idea may sound crazy then, but later it can sound quite normal. I am aware that this actually proves nothing, but then again, the reason for this topic is so that people who took an interest could learn and grow if they decided to. Not to decide who was "Right". Take the brain for example. We have brain waves and thoughts have an electric signal. We know very little of how the brain works or how it impacts the world outside. These signals may very well leave our heads and travel outward to affect our surroundings (strange as it seems). Continued research is obviously required. I am just asking that people study it and give it a fair chance (such as watching a DVD or reading a book on it) and give it a real chance. Don't just dismiss it or deem it as crazy, that is a very sure path to closed-mindedness. @ Valroe: I only suggest this because it makes the most sense to me. Thoughts with electrical signals having more of an effect of the world then we are aware of. Nobody understands the brain fully, whose to say it can't be true? The example of aliens sounds like paranoi to me, but who can really say? And besides, it's not like I'm the only one who thinks there is more to life than reacting and what you get is what you get. Give this law a try and see if it works for you. @ Echo: Sure, it makes absolute sense to try to prove everything, but that is not always possible with our current understanding and way of thinking. Give this theory a try and you may just be surprised. Nothing half-hearted will work, the universe knows the difference. Try the links in the first post and: http://www.law-of-attraction-info.com/ if you feel up to it. Finally: What's a few hours of your time to learn something important and potenially life-altering? It's worth it. Yes, it is true that what Galileo Galilei proved about the sun and earth was based on science, but that was not my point. The point is that new or strange concepts (such as the concept of the Law of Attraction) can create revolt, the idea may sound crazy then, but later it can sound quite normal. Copernicus' and Galileo's idea of a heliocentric solar system wasn't necessarily considered crazy because it was new or cutting-edge science. It was considered crazy because the Catholic Church said it was. They believed that a sun-centered solar system was somehow anti-God. I am aware that this actually proves nothing, but then again, the reason for this topic is so that people who took an interest could learn and grow if they decided to. Not to decide who was "Right". How are people supposed to "learn and grow" if they don't know what it correct? Take the brain for example. We have brain waves and thoughts have an electric signal. We know very little of how the brain works or how it impacts the world outside. These signals may very well leave our heads and travel outward to affect our surroundings (strange as it seems). Actually, we know quite a lot about the brain. We also know that those electrical signals don't do anything of any significance to our surroundings. Otherwise, scientists would be telling you to think happy thoughts to get what you want. Continued research is obviously required. I am just asking that people study it and give it a fair chance (such as watching a DVD or reading a book on it) and give it a real chance. Don't just dismiss it or deem it as crazy, that is a very sure path to closed-mindedness. I am sorry but a book by a loon and a DVD about a divorced photographer that wishes her life wasn't in the toilet doesn't count as scientific proof. If you don't want me to dismiss this as "crazy" please stop giving me a reason to do so and give me some real proof. If there is none or if it is unprovable, then it is illogical and irrational to believe it. it's not like I'm the only one who thinks there is more to life than reacting and what you get is what you get. Why shouldn't it be just what you get? What makes you special enough to warrant something more. Do you have proof that there is more to life? Just because it makes you feel better to think that there is something more to life, doesn't mean that there is. It just means that you are likely fooling yourself. Sure, it makes absolute sense to try to prove everything, but that is not always possible with our current understanding and way of thinking. Agreed. However, based on our current knowledge, we can extrapolate what is likely to be true and what is likely to be false even if we can't readily prove and/or fully understand it at the moment. Based on what we know about the known universe, this theory is utterly preposterous. It makes no sense. If this ever turned out to be true, we would have to throw out hundreds of years of tried and true physics research. We would have to revise every universal constant known to man. It would completely turn the laws of nature that have been proved to work every single time upside down. Which is more likely: that everything we know about the world in which we live is completely false or that this "theory" is just a flight of fancy? I probably wouldn't be surprised. Good things happen to me all the time without my actively wishing them to be true. The universe can't "know" anything. It is inanimate. You assume that the chances of this "theory" being correct are 50 percent when they are actually much lower. You seem to think that if it isn't coincidence then it surely must be the Law of Attraction. Well, I have my own theory that you must consider: The Magical Pixie Theory. The MP Theory states that there is an invisible, magical pixie that sits on my right shoulder and reads my thoughts. Whenever she senses a positive thought, she waves her magical pixie wand and makes something good happen to me. It this theory provable? Nope. Is it a new and/or strange concept. You bet! You see, now you have three theories that are equally plausible according to your supposed statistics: The Coincidence Theory, the Theory of Attractions and the Magical Pixie Theory. The MP Theory is equally as provable and equally as new and strange as the Theory of Attraction. It must be right! I feel as though I have just read an documentary on Carl Sagan...OMG! I know and believe that "Good Things happan to Good people and Bad things happen to Bad people"
But to bring the Cosmos and Quantum Physics into play with whether you will be succesful, Wealthy and Happy is Pure Bologny....Sorry. But, Nice Read..I am Now ready for my Spiritual Nap! I feel this discussion has served its purpose. Those who wish to study it can, those who don't that is fine. If it can't be proven, so be it.